New car registrations in the 29 European markets covered by JATO Dynamics show that the current positive sales trend continued during April, with 1.32 million units sold, which is 108,000 units more than the total recorded in April 2015. This was higher than the growth seen in March 2016 (+5.6%) and in April 2015 (+6.9%). The YTD volume for the 29 markets totalled 5.25 million cars, which is 8.3% higher than total registrations between January and April 2015. The March SAAR came in at 15.38 million units. Following last month’s trend, SUVs dominated the market, counting for 24% of total registrations, up by 2.6 percentage points compared to April 2015. This means that SUV volume growth (+22%) was higher than the changes posted by the rest of the segments, except for sports cars (+30%). While SUVs gained share, the subcompacts (B-Segment) registered the highest market share fall (-1.3 percentage points) and they were followed by MPVs with -0.7 percentage points. Most of the SUV category’s growth came from more registrations of large SUV (E-SUV) and small ones (B-SUV). Around 12% of total registrations in April were for Volkswagen cars, which continued to lead the entire market thanks to the Golf, Polo and Passat. However its volume grew by only 2.4% in April, which was under the total average growth, meaning the brand lost 0.8 percentage point of share over April 2015, the biggest loss of all the brands. Volkswagen’s big rises posted in Spain and Poland were offset by a fall in markets such as Switzerland, the UK and Netherlands. Its SUV registrations fell by 13%. Renault, showed the same percentage growth as the total market, allowing it to outsell Ford at third position and +1.5% growth. The three German premium brands and Fiat were the only brands to outperform the total market’s growth within the top 10. Mercedes posted the highest market share gain, followed by Honda and Fiat. “The slowdown in growth posted by Volkswagen has not stopped overall growth as consumers continue to move to other mainstream and premium brands. SUV demand is also part of this shift,” commented Felipe Munoz, Global Automotive Analyst at JATO Dynamics. 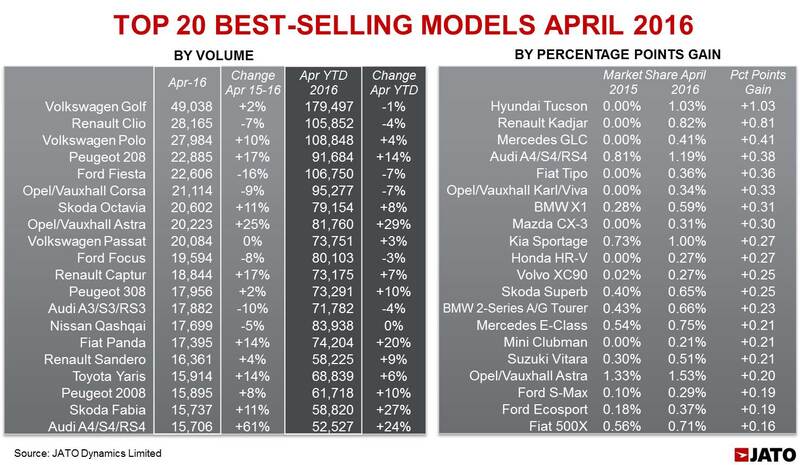 April was again led by the Volkswagen Golf in the model ranking. The German brand registered 49,000 units of its popular compact, with volume up by 2% over April 2015. This model was affected by lower demand in Switzerland (-18%), Netherlands (-18%), Belgium (-16%) and small growth in Germany (+2%). Although it was a lower increase than the total market’s, the Golf did not record negative changes as seen with Renault Clio (-7%), Ford Fiesta (-16%) and Opel/Vauxhall Corsa (-9%). In contrast, strong growth was posted by the Volkswagen Polo, Peugeot 208, Skoda Octavia and Opel/Vauxhall Astra. A significant change occurred in April, as the Renault Captur became Europe’s best-selling SUV with 18,800 units, outselling the Nissan Qashqai, the established leader. The last time this happened was June 2015. The small SUV from Renault benefited from a 29% rise in France, +26% in Germany and Belgium, +19% in the UK and +18% in Switzerland, while the Nissan recorded volume falls in Switzerland (-44%), Netherlands (-34%), Czech Republic (-23%), France (-14%) and the UK (-5%). Part of the Qashqai’s drop is explained by the rise in popularity of new direct rivals such as the Hyundai Tucson and Renault Kadjar. 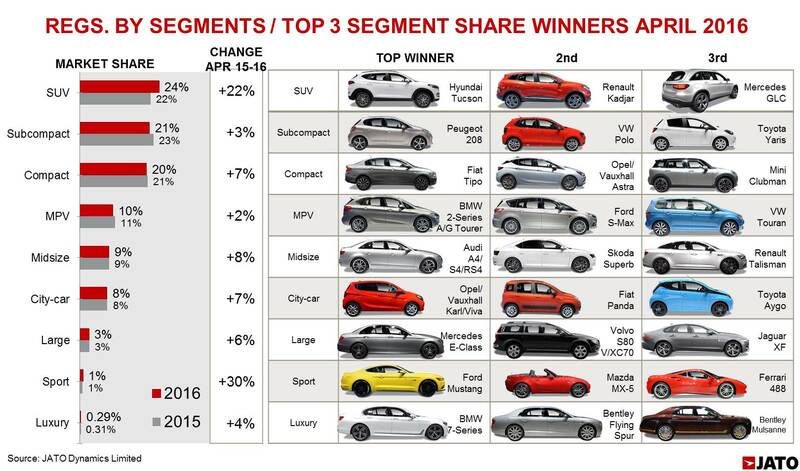 In reality, these two compact SUVs retained their positions as the big market share winners. The Hyundai Tucson was the 23rd best-selling car in Europe during April and managed to control more than 1% of total market thanks to outstanding results in Belgium, Cyprus, Czech Republic, Ireland and Slovakia – where the Hyundai Tucson was first position in the C-SUV ranking. It occupied second position in Italy and third in France. The Renault Kadjar closed the month accounting for almost 1% of total European car registrations. The third model to post the highest market share gain was another SUV – the Mercedes GLC. This D-SUV managed to get very close to the popular Audi Q5 and Volvo XC60, outselling the BMW X3. Other winners include the new Audi A4, which jumped from fourth place in the D-Segment ranking in April 2015 to second position last month thanks to a +61% increase. This Audi was the best-selling premium midsize sedan/SW during April. The new Fiat Tipo compact sedan also posted an important result with 4,700 units sold, or 1.75% of the C-Segment registrations. “The latest new model launches appear to be going down well with consumers, and this is helping to boost the new car market as a result. In particular, the appetite for SUVs remains as strong as ever,” concluded Munoz.